The latest addition to my growing list of freediving kit is my new Sporasub SP1 freedive computer. 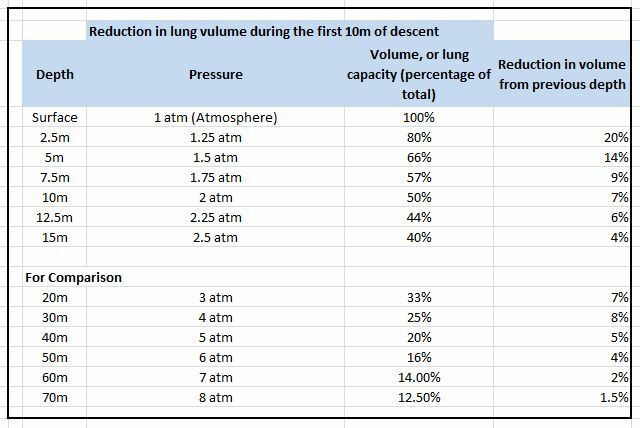 This helps me with one or two of my frustrations which I am sure that I share with other new freedivers. How deep am I going? How long am I down for? How many dives have I done? One of the reasons I prefer freediving over scuba is the simplicity, so I really don’t want to clutter my body or my thought processes with anything more than i have to. This is the perfect tool for me; as well as satisfying my curiosity, I con now benchmark one day’s diving against the next to see how my performance is changing over time. Why did I go for the Sporasub SP1? Well, I started at the bottom of the price range (this cost £145 or $225), and worked upwards, luckily my criteria were satisfied by this one, which happens to be the cheapest on the market. 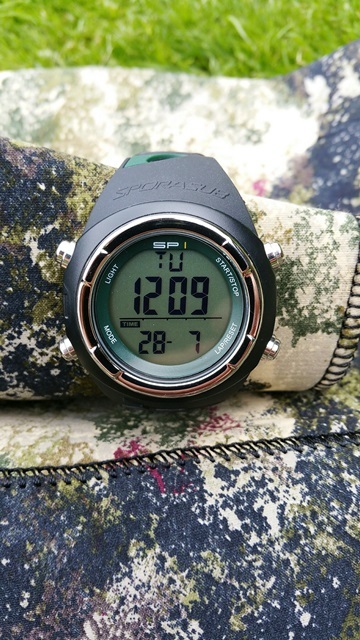 It was also dropping in prices as the new Sporasub SP2 is available with wireless connection and heart rate monitor, and I wanted to snap one of these up before they stop making it. Something that automatically kicked in to log dives without me having to remember to press any buttons. 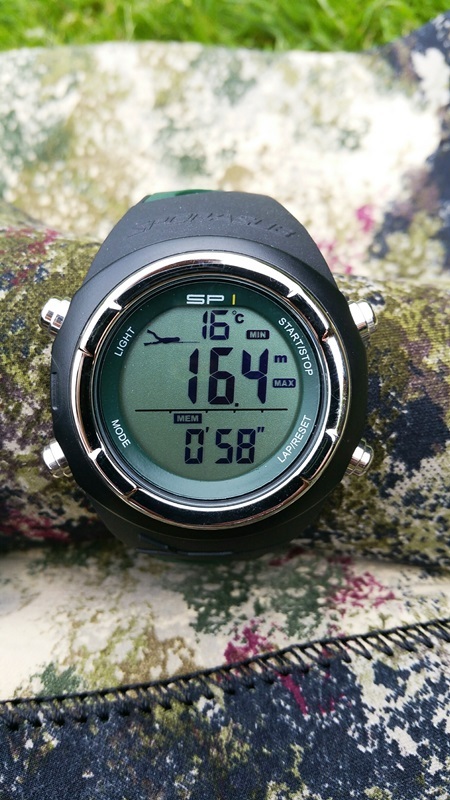 A scuba watch that also had a freedive function (watches with more than one button are confusing enough for me without having loads of extra functions I will never use). Something that relied on me having to press buttons before every dive (something else confusing that I can’t be bothered with). To spend double just to get extra functions that I won’t ever use unless I start training and competing at deep diving. Dive mode automatically kicks in when the watch is submerged by 1.5m, you don’t have to do anything, it just starts logging straight away, even if the last time you looked it was just showing the time. It logs dive time, dive depth accurate to 10 cm, water temperature. It saves these records for you to look at later, up to 199 of them. Depth warning, it will beep for 30 seconds when you reach a preset limit. Other stuff you would normally get on a watch, time, date, stopwatch etc. Summary – It works first time and every time, logging all the dives I do accurately (when compared to another borrowed dive computer strapped to my leash in a recent test dive). I found the controls a little infuriating to start with when I tried to look at the dive starts whilst the screen was still displaying surface time. But this is more about my not remembering the instructions than design fault. Who would I recommend this for? Any recreational non competitive freediver or spearo who wants an easy way to log their dives. Who would I not recommend this for? More serious competition divers who want to really monitor things like ascent speeds, who need 10m warnings and want to monitor heart rates while diving. Those guys probably want to go for something more swanky, but they are going to pay in the region of £100 to £200 more for these functions. Am I happy with the SP1? Yes. It looks cool too, though my wrists are so skinny I won’t be wearing it as a fashion accessory. This entry was posted in Apnea, freediving, Spearfishing, Wetsuits & Gear and tagged freedive computer, freedive watch, Freediving, freediving computer, Sporasub SP1 on July 28, 2015 by mybluejourneyeditor. Well today we visited my most local beach as I knew the visibility was going to be good and I hoped to see some of the big barrel jellyfish that are swarming up the coast at the moment. Unfortunately I didn’t see any, but the viz was probably about 6-8m and there was plenty of other stuff to see. Unfortunately I have learned the hard way about the standard GoPro Hero2 underwater housing. It doesn’t focus properly underwater! What! I think it is fair to assume that an underwater housing good for 40m will actually take reasonable pictures underwater, but no, I got it wrong. I need the flat lens dive housing. The standard one, although waterproof to 40m doesn’t actually work properly underwater, it is still really just meant for surfing etc. where it is expected to take pictures above water. You can see a short video here that illustrates the problem (apologies for the spelling mistake). It is colourful, and the subject matter would be quite interesting, but it never going to be great until the focus problem is sorted so watch this space for some more impressive video when I get a new housing. 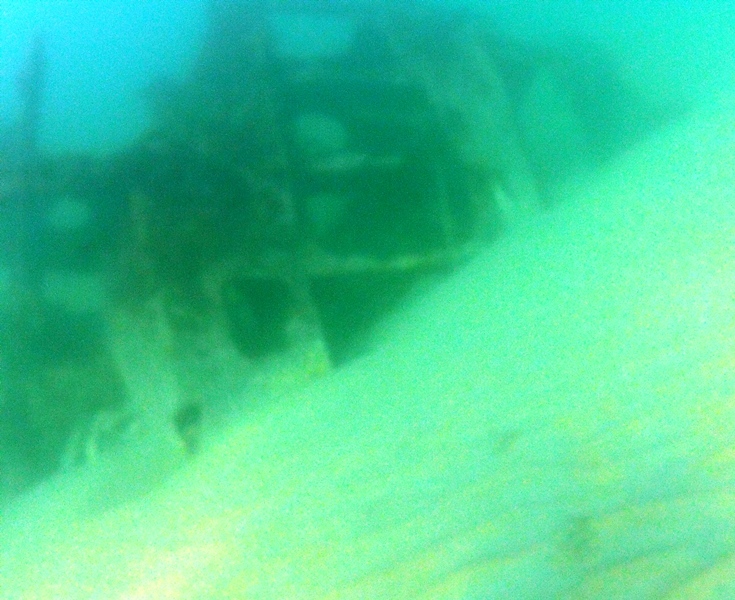 The trip was still worthwhile, the local wreck, Louis Shield is just off the rocks. There are some bits in open sand in the middle of the bay, on a very low spring tide these are just visible. 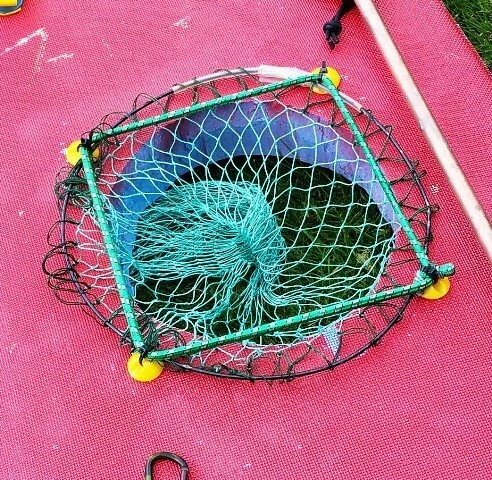 Today the top was about 2m down, and 4m to the sand and tangled with old nets and lobster pots, quite dangerous in fact. The bulk of the wreck is just off the rocks, again this is almost too shallow to dive sometimes. 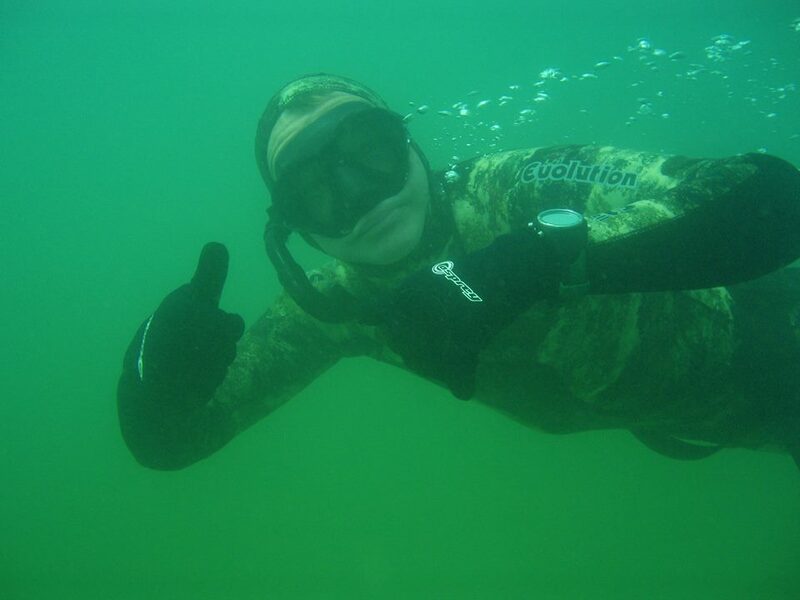 This entry was posted in freediving, Marine Foraging, Underwater Photography, Wetsuits & Gear and tagged devon, Freediving, GoPro, hero2, Underwater photography on May 25, 2015 by mybluejourneyeditor. My new GoPro Underwater Housing – More to learn! Yesterday I took my new GoPro housing and underwater selfie stick for a test. I have had a GoPro camera for a long time so I am used to the benefits and otherwise of using it, but this is the first time I have tried it underwater. The housing was watertight, that’s the main thing, so I haven’t lost a camera. Other than that, well, let’s just say I don’t have much to publish that will win me any awards. Part of this is due to the fact that the water was so cloudy, full of bloom and microscopic stuff which left everything looking green. That and the fact that there wasn’t much marine life around to photograph, a few small crabs on the sandy bottom to follow, one big ugly spider crab, and no fish. I didn’t even look great when I turned it on myself. Nothing to look at here! This entry was posted in freediving, Underwater Photography and tagged Freediving, GoPro on May 18, 2015 by mybluejourneyeditor.